Whenever I ask readers what you struggle with the most when it comes to managing the house, laundry is always high on the list. Creating a laundry routine that works is the first step in beating the never ending cycle of washing, drying, folding and sorting. Before I share my laundry routine, let’s quickly look at the biggest hurdles for staying on top of the laundry. If you’re constantly short of socks and the kids uniforms are never washed on time, your biggest hurdle is probably getting the washing INTO the basket (and washed) in the first place. Luckily, this is the easiest laundry hurdle to overcome. The washing gets done and dried, but it never makes it back into the wardrobe. This is my issue! I can get it all washed but I struggle to get it all put away. I have discovered a bit of system that works though… keep reading. 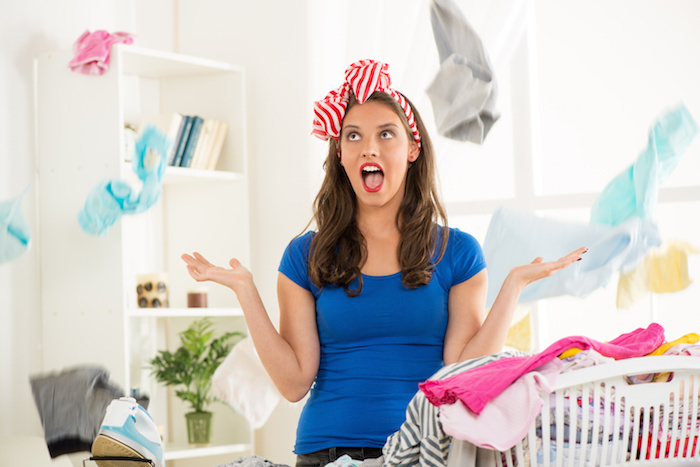 The biggest factor in creating a workable laundry routine is regularity. Don’t let it build up! We wash every day, even if it’s only a small load. If I let it pile up until the weekend then we will probably run out of underwear or school uniforms and I’ll run out of motivation to get it all folded and away. It is much easier to wash, dry and put away a small load than it is multiple giant ones. Dried in stains are always harder to remove. Have a stain removal spray or paste ready to go as soon as you notice the stain. You might also find this post on how to remove oil stains from clothes helpful. Create a routine where the washing goes into the machine the night before and is on a timer to start early the next morning. Once you are up, washing is done and ready for the line or dryer. If it works better for you to have it finish at a different time then just adjust how you set the timer. Make it a routine though that happens every day. I try to do washing loads by person if I can (or at least people who’s clothes are in the same room!) Even when that isn’t possible I try to hang it out in sections by person. That way, when I go to take it in, it’s already sorted. Save time on ironing (who wants to iron anyway!) and make it easier to put away by folding washing as you take it off the line. It actually doesn’t take much more time and it means it is all folded and sorted. One step closer to being put away. Once you’ve got the washing off the line, folded and in order of who owns what, put it straight into the cupboards. If your kids are older, stack it at the door to their room and make it a rule that there is no play and no technology until it is away. Now this one is controversial, and my husband is NOT a fan, but I’m all for using the dryer. I don’t use it for everything, but I do like freshly dryered towels and I don’t see it as a good use of my time to hang out 100+ small socks and undies each week (yes, there are actually that many). If you have a dryer, use it wisely. Plan out your loads so you can get in a full dryer load and don’t have to pre-sort it. No it is not the most energy efficient or budget friendly option, but if you have lots of small children (or big ones that seem to go through socks and undies like mad) then it might just be worth it. Empty the basket into the washing machine each evening (pre sprayed for stains, trying to keep darks and lights separated if possible). Generally socks and undies are kept for a few days so I can do a dryer load. Set the washing machine on a timer to start/finish early the next morning. When the washing finishes in the morning, my husband hangs out before work or I do it after school drop off. Washing comes off line (folded by family member). Clothes stacked in bedrooms and put away (my 5 year old helps with socks and undies and putting his clothes in drawers. On Tuesdays we change linen and this goes into the machine straight away.